Camels Worksheet – Free Easy Science Worksheets to Download for Kids. Our fun free hidden words puzzle game for kids about Camels is a fun way for kids to learn about Camels in school, after school or at home. This printable word search game can be enjoyed by kids in Grades 1-5 as a reading comprehension activity. Kids in Kindergarten and Pre-K kids will enjoy using this camels worksheet as a listening comprehension tool. EasyScienceforKids.com is one of the best free online resource for educators with many free downloadable worksheets to print for kids. This downloadable science activity sheet has a fun words seek game as well as ahidden words puzzle game for kids. These are only two types of surviving camel species. These types of camels can be found in the Middle East and Central Asia. The word “camel” is derived from Latin and Greek words. Camels are desert animals that can survive a long time without water. Learn all about camels and more fun facts about Camels here. [sociallocker]Download this FREE hidden word puzzle game about Camels. Download this fun printable FREE Camels Worksheet for Kids! Liked this Free Camels Worksheet? Find out lengthy information about the Camels here. Declan, Tobin. " 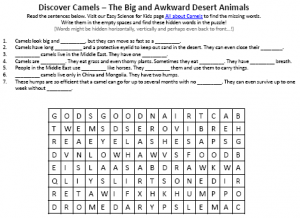 Camels Worksheet - Free Easy Science Worksheets to Download - ." Easy Science for Kids, Apr 2019. Web. 21 Apr 2019. < https://easyscienceforkids.com/camels-worksheet-free-easy-science-worksheets-to-download/ >.